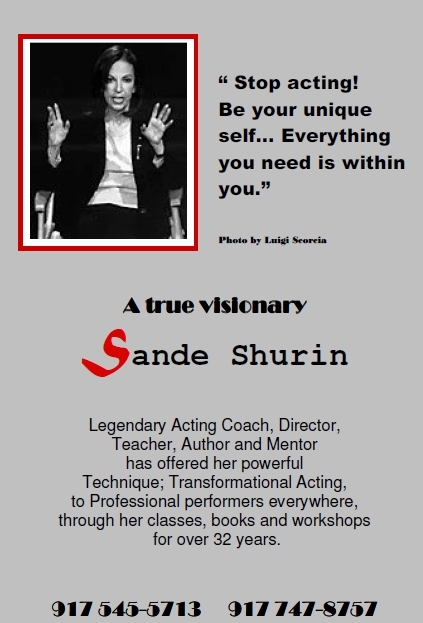 In 1980, Sande Shurin changed the Direction of teaching acting with her new “Self and Character” based technique called Transformational Acting. Focusing on the uniqueness of each actor and developing their ability to be “Prescenced”, to use their current emotions, and to transform who they are into the written character. She coaches the actor to take bold actions, take risks, and continually move past their limitations. She does this in her NYC and Woodstock NY Acting Studios. Sande also private coaches in person and on Skype. Shurin’s coaching has appeared on Oprah, as acting coach on America’s Next Top Model, as well as many other Reality shows. 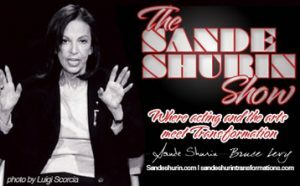 She has directed on and off Broadway, and also the TV series: “Working Actors”, and for film: “True Love” and “Museum Scandels ” Sande is the auther of 2 books: “Transformational Acting – A Step Beyond” and “Star Power – Defining Your Individual Signature”.